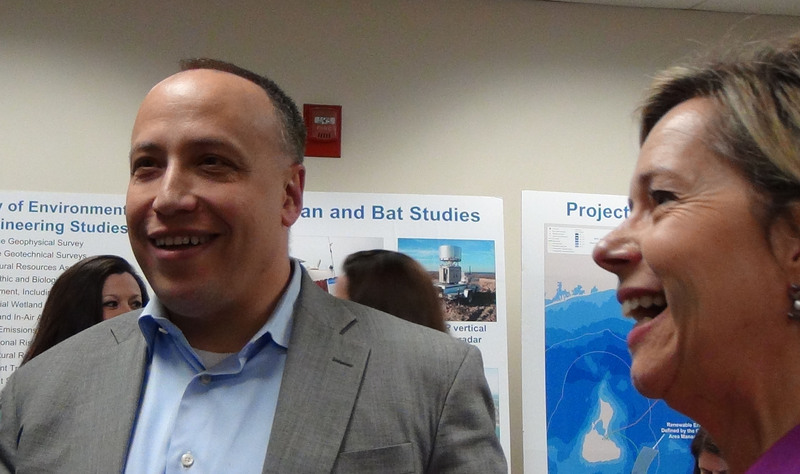 Jeff Grybowski, CEO of Deepwater Wind celebrates a moment of victory with DWW counsel, Robin L. Maine in May. According to the Block Island Times, the total payout of $2.5 million is slated to be split evenly between the Southeast Lighthouse Foundation (SELF) and the Block Island Historical Foundation (BIHF), with a portion of the SELF funding dedicated to restoring the Southeast Lighthouse. “It’s $1.25 million each for Southeast Lighthouse Foundation and Block Island Historical Society,” said Meaghan Wims, spokesperson for Deepwater Wind on Thursday. The release went on to say that Deepwater Wind’s contribution will anchor an ongoing fundraising effort, that includes pursuit of additional funding and development of an endowment fund. The majority of funding was said to be scheduled for 2016 when BIWF commences operation.